The New Millenium Secular Bull Market ? 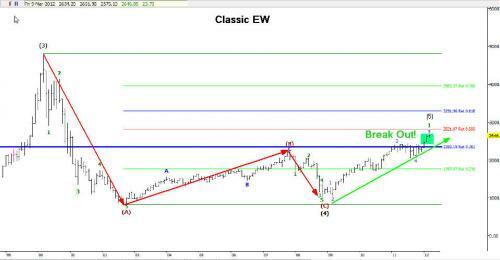 a most common Elliott Wave A-B-C corrective structure. 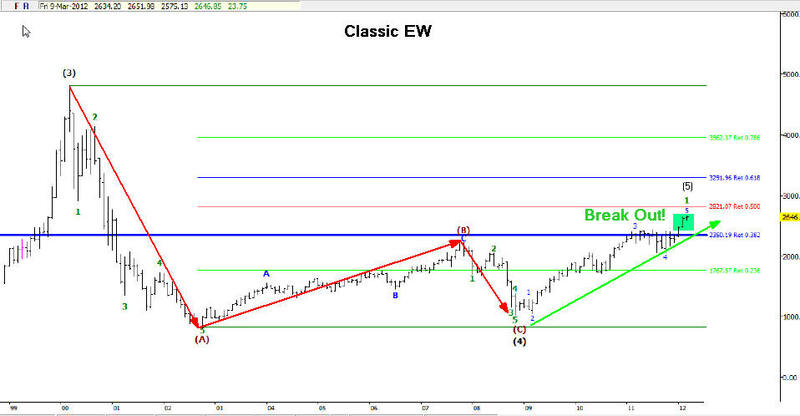 More specifically a FLAT correction defined by the extent of the B Wave retracement of Wave A. (Zig-Zag being the other A-B-C corrective structure) Looking at the time relationships between the proposed wave A (2000-2002) and wave C(2007-2009), if this is still only wave 2 up of C down we are getting very "long in the tooth" approaching 2X the fibo time extension of Wave A with most of the wave yet to develop (waves 3-5). The 2008 crash was very violent and not quite .618 the time of Wave A and it exceeded it pricewise. This left interpretation open that that C was not yet complete. At least 90% of C waves are .618 - 1.618 X wave A in both time and price...very rare for them to exceed 2X much less go to a 2.618 because they are the strongest impulse waves (including wave 3's) because they are fear and panic driven. This Wave C exhibited a perfect 5 wave impulsive structure down. I think most would agree the financial crisis was a vastly more fearful event than the "tech bust" wave A down in 2000-2002. So this fufills Elliott's "personality" of C-waves. I believe therefore of little chance we are still in a wave C down. It is more likely if in corrective (secular bear) mode it is morphing into a very atypical, complex corrective structure. Glen Neely has identified dozens but he clearly states as longer and more complex corrections transpire the ability to predict future structure plummets. Currently a large degree structure has formed that fufills all of the standard EW requirements of an A-B-C "Flat" correction; therefore I must accept the potential we have entered a new secular bull market. If indeed this a minor Wave 1 up of a larger degree Wave 1 advance it will by nature be very weak, choppy, drawn out affair, could take years to complete, and possibly but not necessarily take out the prior all time highs in SP and DOW. So it will seem as if we are still in a bear market for most of this decade. The most striking implication of this is that it nulls the possibility of another severe crash-like bear market and future global financial annihilation type perspectives may have a rough time of it from here on out. The first chart is of the SP 500 with Fibo Time extensions and Wave counts I am referring to above. The third chart is SP FCS trading chart still on BUY. Interesting how the advancement waves all have gone in 200 pt moves with slow, grinding moves up and volatility contracting. Impulse waves up or down should exhibit expanding volatility but we are in a huge range yet and volatility in longer view contracts as ranges progress so maybe this explains it. It does leave suspect of BOT/program trading influence but that may be a new feature of the next secular bull, volatility will become almost meaningless to interpreting market behavior. As I posted earlier I cashed in my Equity long position much too early and pocketed a nice profit, the FCS still remains on BUY and if I had stayed with it a much more handsome profit would be at hand. for my FCS gold trading system. See why I really only enjoy trading GLD? The BKX vs SP continues to show banking stocks playing an increasing diminutive roll in the over all market. Same with housing stocks. So perhaps this implies the American consumer will have a much less significant roll in the new "global" millenium bull market. My commodity FCS remains on buy but with little upward progress, so far only crude and precious metals are climbing, grains and soft comms flat but I am sure this will change as we see things rapidly improve over president Obamas next four years in office and global demand for everything accelerates. OK I am getting a bit tongue in cheek here. Enjoy the charts and stay safe. It's time again to listen to Charlie Chaplins "Smile"
PS Did you hear the new name for the GOP front runners? Massive Gold smackdown, FCS SELL, I sold before the close. Gotta bad feeling this is going to be big move down now. 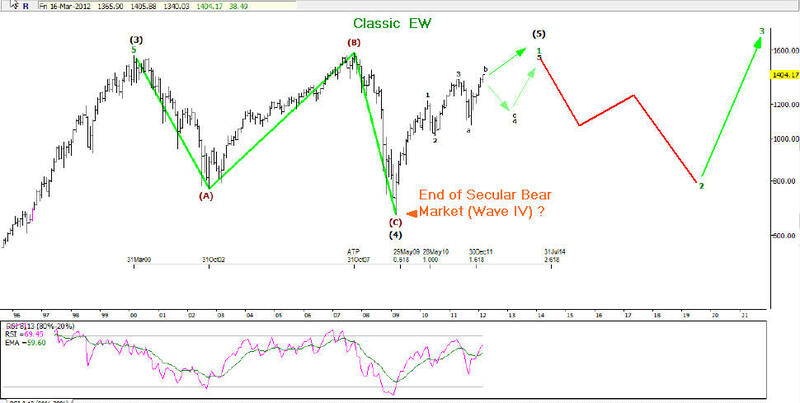 After several emails about this seemingly bullish post, I feel the need to console the bearish crowd by providing more clarification and detail about my Elliott Wave Theory (emphasis on theory) interpretations. The majority of the time Elliott Wave Theory involves 2 or more possible counts and very infrequently only one, which obviously is when it becomes most useful for trading. The original theory was developed by Ralph N Elliott after the 1929 crash. Robert Prechter became an ardent student and follower and continues to carry the EW torch. 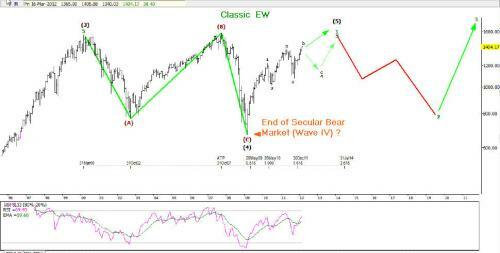 His text "Elliott Wave Principle" is considered the key reference of Classic EW. Glen Neely has done an immense amount of research and greatly expanded the depth and complexity of understanding EW. His text "Mastering Elliott Wave" is a detailed reference of his discoveries and own application of EW for which he has adopted the name "Neowave." I have studied and practiced both methods for decades. EW trading is similar to other forms of "pattern trading" and by that I mean when a particular pattern forms it increases the probability of a certain future market behavior. I am mainly a "system trader" and that is what led to developing the FCS. However at certain times, high probability "set-ups" occur and can help one bag profits. OK well enough about that for now. 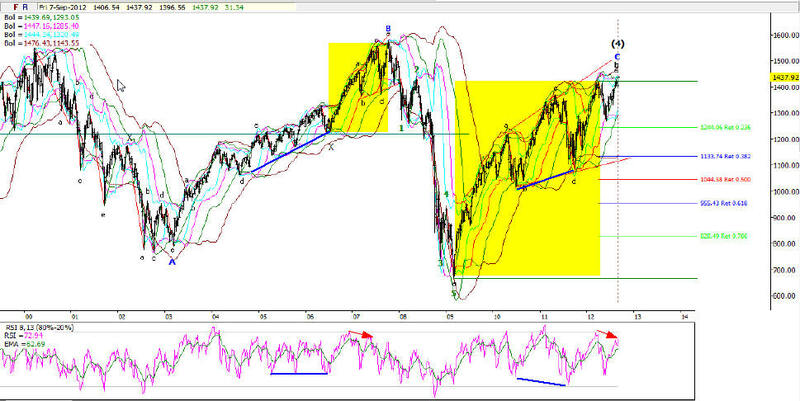 I am posting two long term (monthly) charts of the SP 500 with the prevailing Classic EW count and Neowave count. I don not subscribe to either Prechter or Neelys charting/trading services. I prefer to do my own work but often enough I come upon a their charts in the public domain and I am fairly certain they are in agreement with mine. Anyway Classic EW as I posted already has us in a new bull market. I plotted the most typical, simplistic future wave developement. Often wave 1's don't exceed the prior correction highs and are usually deeply retraced by wave 2. This is shown on the chart and hopefully clarifies my statement that it will seem as though we are in a bear market most of this decade. 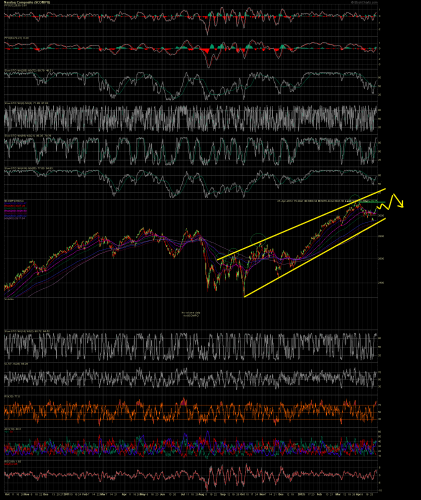 Wave 2 could be another fairly deep, prolonged bear market but is a ways off. 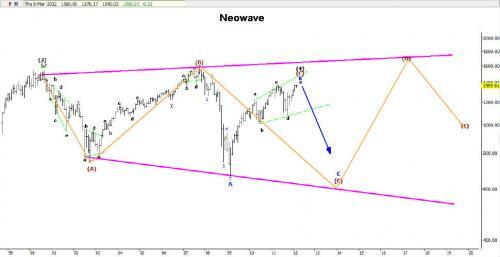 The Neowave count has us in the third or C wave down (currently has been bull market leg up subwave) of a massive expanding triangle. This count also has a fairly large sell off yet to come however timewise much sooner. Both counts point to us topping in here, the classic will lead to a minor sell-off and another pretty nice move up. 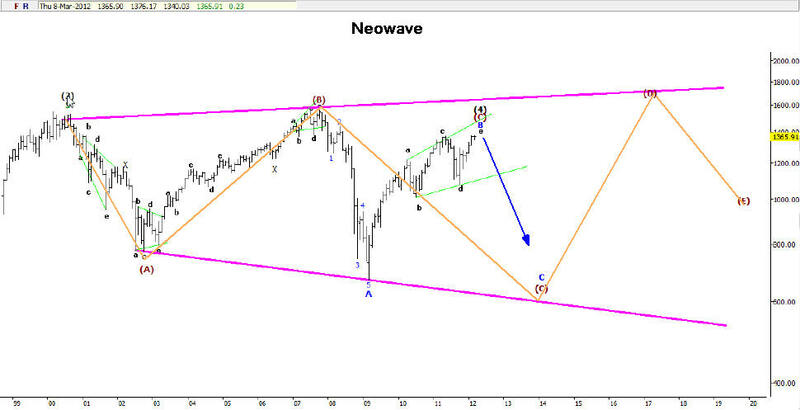 The Neowave count if correct means this will be a quite a move down, soon to kick in and probably lasting 1-3 yrs before a big bull market with upward leg, wave D, of the triangle. Looking at the Nasdaq 100, the Classic and Neowave counts in my opinion are the same, very clear A-B-C zig zag correction, with the B wave consuming a very long time all point to conclusion of its bear market and now a very significant break out! It will be interesting to look back and see how the future actually fits into these scenarios if at all but I am leaning on the classics counts. Short term, I am closely watching for a shot at another shorting opportunity very soon but don't have great expectations for it to be a grand slam type trade. Incidentally, gold is holding up quite well so far, if it fails to break any major support levels in next month or so I may have to change my outlook and that last high could be taken out in a hurry. Bond FCS finally goes to SELL! BUY signal on GLD, jumping in! 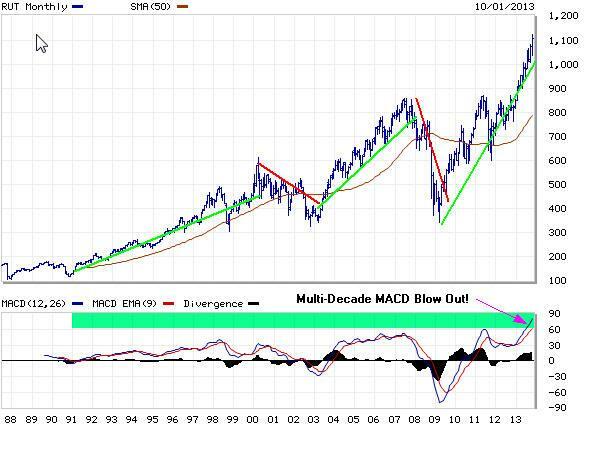 The size and speed of the 2000-2002 stock market decline made it clear a "larger degree" correction had begun. That correction had to exceed the time of the prior bull market, which was from 1982 to 2000 (i.e., the correction staring in 2000 needed to last more than 18 years). As a result, by late 2000, I knew the S&P had begun a 20 (maybe 30) year correction! Inside of that 20-30 correction, Wave-A bottomed late 2002; wave-B topped late 2007 (wave-B ended January 2008). After obtaining that information, projecting the ideal time for C-wave was easy. All I needed to do was apply the NEoWave TIME rules found in Chapter 9 of Mastering Elliott Wave (MEW). There I wrote, IF wave-B takes much more time than wave-A, the time of wave-C will equal half the total time of waves-A+B. In this instance, Wave-A took about 2.5 years; wave-B took about 5.5 years. Their combined times (8 years) divided by 2 yielded 4 years. So, that is how I initially knew (in mid January 2008) that wave-C would take at least 4 years. Addressing your second question, what recent event forced me to extend the required time of this bear market? The shape of the correction, which started January 2008, is that of a Flat. Wave-b of that Flat takes far more time than wave-a; so, the time of wave-c will follow the same rules mentioned above (i.e., it will be about half of a+b. Small wave-a consumed about 1.25 years, and small b-wave took nearly 3 years. Adding the time of those two patterns and dividing by 2 yields 2+ years as the ideal time projection for wave-c. When applied to a recent chart, we can comfortably assume wave-c will end in early 2014. No new bull market but another new high on Joke then down?? ALL broad market indicators after this weeks close are on SELL. The FCS signaled trading exit few weeks ago but as I previously relented I am only trading GLD these days. Gold remains on a BUY with the trade currently at a loss, a secondary BUY signal fired this week as we tested the prior IT low. Bonds also went to buy last week and have continued to rally to their previous high (low in yield) I did not take this trade either just too damn risky. As usual waiting for Ben to blow short traders out with another QE and thousand point plus Dow rally in a day or two. Possibly once Ben does his job and that rally fizzles and we get good downward momentum I may try some short swing trades. HUI looks like it may pause here but in steep drop and too risky to trade. on the appearance of a potential large cup and handle formation, one of the most reliable patterns that proceed BIG moves. Watch for the handle. This trade has tested our patience and I came close to closing it out but as it progressed the volatility greatly subsided and the original range held making it easier to wait it out. Really I think we are in early stage of the next large wave up in gold. My indicators went to BUY mid-summer while I was at my Canadian residence but I don't trade the equity markets any longer for reasons I have previously stated. Hopefully next year I will have internet service up there and be spending my entire summers away from the madness down here. Gold really had a nice pop this week and indicators are showing this implulse up is strong. I will be looking to take an additional pattern long trade on next pull-back, looking for a small "handle" type retracement after this surge ends. I hate the equity markets but have noticed a lot of technical and pattern related factors pointed to this being the last "blow-off" type of move in this almost 4- year bull market. Lets face it just timewise this is getting long winded, the last one leading to the Bush era crisis melt down in klate 2007 was a bit over 4-years long. Neowave is fitting nicely into the end of this pattern, this being a final e- wave move in a large expanding termination wedge. Look back at the smaller fractal of this (yellow highlighted) before the bankster meltdown top late 2007. Many other examples of this formation in the major indices going back years but I am not going to post all that. I am tempted here to possibly make a short trade; I will be looking for this blow off to show reversal pattern and maybe take a small position. If it blows off and comes back down to take out the March high/August low it will be a great 2-B top short trade. I will keep you posted. But anyway I think the gold train is again leaving the station. Gold FCS issued a SELL signal Tuesday, exited this trade at a profit after long time holding it. This however may be the handle forming on a gigantic cup and handle. I would not be surprised to see a new buy signal in next few months, may enter on strictly a pattern trade. 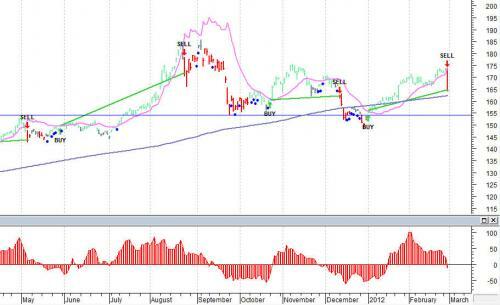 GLD FCS signals sell after lengthy trade opened in March but it posted a small profit. Bigger picture is extremely bullish with Adam and Eve consolidation, now forming handle on cup (or eve) I am looking for this to round out and come back up to where it started at which point I will be entering long again even if FCS has not signaled a buy. This is one of the most reliably bullish formations in technical analysis. break upward this year. Nice established range will help me determine how to position. EQUITIES - No question we are in the final capitulation/mania stage of this rally since the 2009 lows. Amazing the concafony of justifications this past week about how this is a new secular bull market here to stay and those not in stocks are fools. But technically still dangerous to be a bear, I am looking for the mania to bubble another month or two and Dow to hit or more likely to exceed its prior major high by a few hundred points for a typical devious bull trap! March is a high probability topping month. BONDS (yields) - Looks like a bottom is in, currently my signals are all on a sell but we are coming off such an extended low. Even if we creep up to 3 or 3.5 whats the big deal? A push beyond 3.5 and I will be concerned. I know what I think, how about you?